Deep in the woods, in the quiet, far flung corners of west Wales, pine martens have returned. Abundant in Scotland, pine martens (Martes martes) are extremely rare elsewhere in the UK. The Vincent Wildlife Trust is enjoying success with its Pine Marten Recovery Project, translocating thirty-nine martens from the forests of Scotland to Ceredigion, monitoring them and their impact on the local flora and fauna. Elusive, shy and independent, martens live chiefly solitary lives under the moon and stars, favouring the quiet of the night, seeking places that humans rarely tread. They are true sylvan creatures and thrive in deciduous woodland, although many of our new neighbours have settled well into the coniferous forests common to Ceredigion. Martens settled in Britain after the last ice age, around 10,000 years ago, thriving in the ancient greenwood of the Mesolithic period. Roaming freely over the entirety of Britain, martens were abundant and widespread, perfectly adapted to forest life, living, hunting and mating beneath the leafy cover of our native woodland, nesting above ground in tree-hollows. Now, with much of our ancient woodland lost, few marten populations survive outside their stronghold in Scotland. Major deforestation in the 18th and 19th centuries caused this decline, along with persecution from gamekeepers and farmers. By the 20th century, martens had all but disappeared from most parts of Britain. Martens are similar in size to the domestic cat, with a distinctive cream to yellow throat ‘bib’. They have long bodies, light to dark brown coloured fur, and long bushy tails. They have rounded, prominent ears and sharp teeth. They hunt, forage and scavenge, feeding unselectively on small mammals, birds, bird eggs, frogs, insects, carrion, nuts and berries, adapting their diets to what is most readily available. Grey squirrels make up part of their diet, so martens could prove a beneficial natural control of this invasive species. Pine martens have litters in spring, having between 1-5 young, or ‘kits’. The kits are fully independent at six months and in the wild their average lifespan is 8-10 years. They are the only mustelids that have semi-retractable claws, like cats, making them masters of their arboreal surroundings. In folklore, martens are symbols of determination, skill and luck. 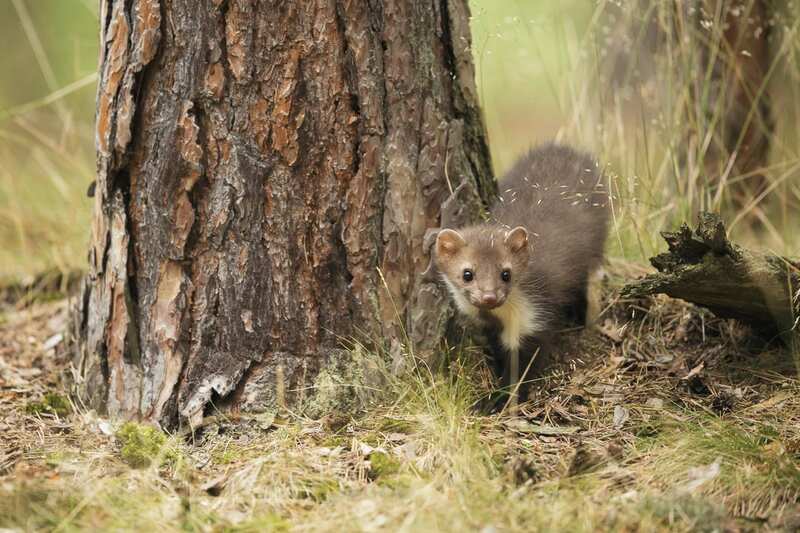 The precarious status of the pine marten has ensured them full legal protection, and it is an offence to kill, capture, damage or disturb them. This, however, is not enough. Their precious habitat needs to be protected, improved and restored. Unlike some British animals, pine martens cannot adapt to urban environments, and will avoid even open countryside. They depend upon the protection of the wildwood, the guardianship of trees, peaceful places away from the industry of man. Pine martens are unlikely to recover on their own, and pioneering projects like that of the Vincent Wildlife Trust are essential to help restore these beautiful mammals back to their former numbers and distribution.